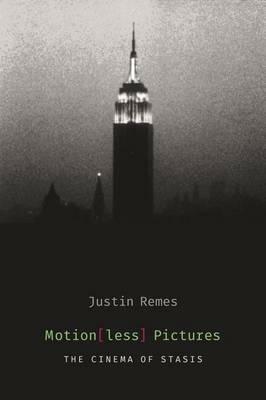 Conducting the first comprehensive study of films that do not move, Justin Remes challenges the primacy of motion in cinema and tests the theoretical limits of film aesthetics and representation. Reading experimental films such as Andy Warhol's Empire (1964), the Fluxus work Disappearing Music for Face (1965), Michael Snow's So Is This (1982), and Derek Jarman's Blue (1993), he shows how motionless films defiantly showcase the static while collapsing the boundaries between cinema, photography, painting, and literature. Analyzing four categories of static film--furniture films, designed to be viewed partially or distractedly; protracted films, which use extremely slow motion to impress stasis; textual films, which foreground the static display of letters and written words; and monochrome films, which display a field of monochrome color as their image--Remes maps the interrelations between movement, stillness, and duration and their complication of cinema's conventional function and effects. Arguing all films unfold in time, he suggests duration is more fundamental to cinema than motion, initiating fresh inquiries into film's manipulation of temporality, from rigidly structured works to those with more ambiguous and open-ended frameworks. Remes's discussion integrates the writings of Roland Barthes, Gilles Deleuze, Tom Gunning, Rudolf Arnheim, Raymond Bellour, and Noel Carroll and will appeal to students of film theory, experimental cinema, intermedia studies, and aesthetics. Justin Remes is assistant professor of film studies at Iowa State University. His essays have appeared in Cinema Journal, Screen, the British Journal of Aesthetics, and Film-Philosophy.